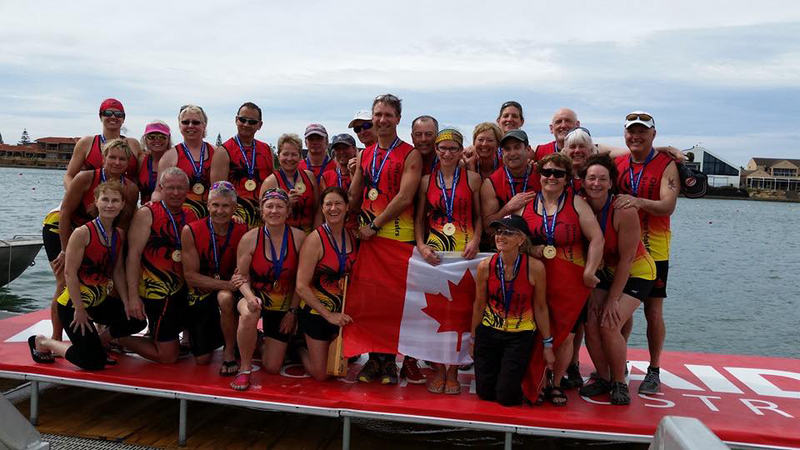 The Ottawa Dragon Masters (ODM) won big at World Championships in Australia. Seeing us coming after a long winter with no open water to practice on, we surprised the competition. Where did you practice, we were often asked. While some believed the chainsaw in the ice story, most knew we spent our winter practicing in pools and gyms. ODM began the three day regatta with a GOLD in the 2 kilometer race. Our sister team, Sport Chicks followed up with a GOLD as well (in fact, they won gold in all the categories). ODM went on to win silver in the 500 meter and bronze in the 200 meter races. The men tried their luck in a small 10 person boat and won GOLD in the 500 meter race by 2 one hundredths of a second. We are very pleased with our development as a new team and now have our sights on the Canadian Championships in August, 2016 and the next Worlds in Hungry in 2018.